February is Heart Health Month. According to The Heart Foundation, “heart disease is the leading cause of death for men and women in the United States. Every year, 1 in 4 deaths are cause by heart disease.” Healthy choices can help manage health conditions and small changes to daily habits can have a big positive impact. 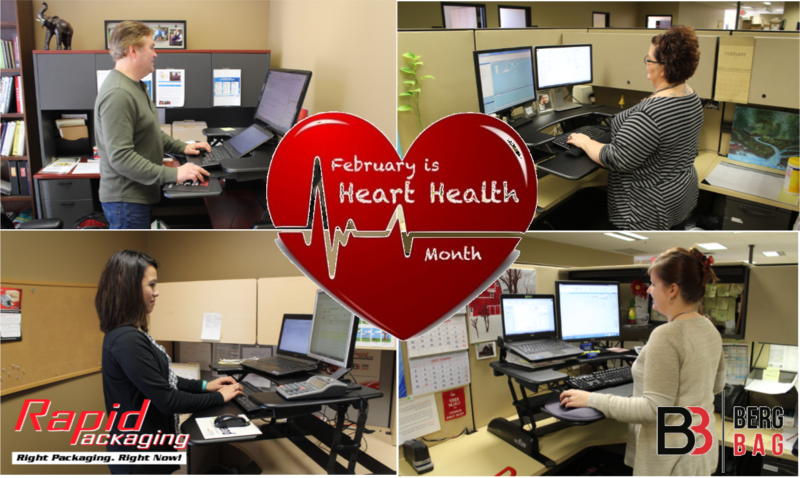 In honor of Heart Health Month, Rapid Packaging and Berg Bag Company are offering stand up desks to their employees provided by Veridesk.com. The benefits of standing versus sitting increases muscle, mobility, and flexibility while decreasing weight, blood sugar, and cholesterol. Several employees are trialing the standup desks to use throughout the workday and the trial has yielded positive reviews. Employees who traditionally sit for nearly eight hours in a workday have the option to stand or sit as the day progresses. Most have reported a boost in mood, increased energy, and reduced fatigue. And it doesn’t stop there. Rapid Packaging and Berg Bag Company have also purchased an elliptical for company use during breaks and downtime to promote heart health. So keep your body moving, your heart healthy, and make positive health decisions whenever possible. Happy Heart Health Month!